It isn't as though Quentin Tarantino and Guy Ritchie have a monopoly on thrillers about hapless criminals barely accomplishing their goals or failing entirely, but few filmmakers pull it off with such style. And few have the deft touch required to make films about bad people doing bad things to other bad people so absorbing. As such it isn't surprising to see other filmmakers trying to borrowing their style. It also isn't surprising that these imitators very often fail to succeed in their attempts. Kriv Stenders is an Australian writer/director, and perhaps the latest to try his hand at the genre. 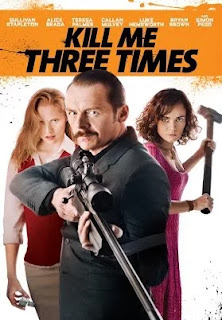 The description says this film is about Charlie Wolfe (Simon Pegg), a professional hitman caught in the middle of a group of people all plotting to kill each other. And while that's technically what happens, this is far more of a ensemble film than that description would suggest. The first murder plot involves suspiciously rich bar owner Jack Taylor (Callan Mulvey) looking for revenge against his cheating wife Alice (Alice Braga). At first Wolfe is hired to follow her in order to catch her in the act. Of course, after her infidelity is confirmed, Jack offers a generous reward for her murder. However, before he can get started Wolfe finds himself following the second murder plot. Jack's sister Lucy Webb (Teresa Palmer) and her husband Nathan (Sullivan Stapleton) plot to murder Alice on Jack's behalf, unaware of the actions he has already taken. Their reasons are, however, more complicated than simple revenge against Lucy's brother's cheating wife. By placing Alice's sleeping body in Lucy's car set ablaze and rolling it over a steep hillside, they will have effectively staged Lucy's suicide. With the help of a crooked cop and some faked dental records (Nathan owns his own dental practice) Nathan will be free to claim the money from Lucy's life insurance. The money would go toward freeing him and Lucy from some rather steep gambling debts. And the third murder plot (though there are a couple other murders) involves Alice's new boyfriend Dylan (Luke Hemsworth) getting revenge on anyone and everyone he suspects might be involved in Alice's disappearance. The structure of the film is a bit too clever for its own good. Stenders does some interesting nonlinear editing, but it hints at, and in some cases outright spoils, what could have been interesting plot points. It's a needlessly complex structure meant to mask its otherwise very straightforward story. One of the reasons Tarantino and Ritchie's films are so enjoyable is for their strong, comical or intense characters (typically backed up by brilliant performances) and mostly well written scripts. The script for "Kill Me Three Times" by first time writer James McFarland, however, is full of holes and its only real plot twist feels forced and unnecessary. It is, as we might have suspected, yet another betrayal in a film full of betrayals. Again, movies about bad people, doing bad things to each other are tough to pull off, because it's hard to make an audience care about them. The only character, if any, that's worthy of sympathy is Alice, yet her infidelity was what started the whole thing (not to mention her eventual theft of the man she cheated on). They are all flat, underwritten, and played with little if any personality. Simon Pegg is the most recognizable star here, and he is about the only one to lend a sense of personality for his part, yet his character feels like a disconnected afterthought rather than a main character. His motivations are the least interesting, and neither he nor any of the other characters have quite enough screen time to earn the sort of investment we should have had in them. You'd be hard pressed to care about them while they all inevitably injure, maim and murder each other in particularly ugly ways. This film so clearly wants to be that Tarantino/Guy Ritchie brand of light-hearted action film about comically incompetent gangsters, assassins, and gamblers down on their luck. Yet their goofball blunders endlessly complicate matters and lead to some gruesome deaths, including one in which an inexperienced gunman hits a man in the neck severing his carotid artery triggering a disturbingly massive spray of blood. And of course all of this is set to a repetitive electric guitar heavy soundtrack. Yet because it's so comparable, the fact that it's so inferior is made all the more apparent.